I've been wanting to try out this soup for months now and finally did a few weeks ago. We were not disappointed! This soup has SO much flavor. 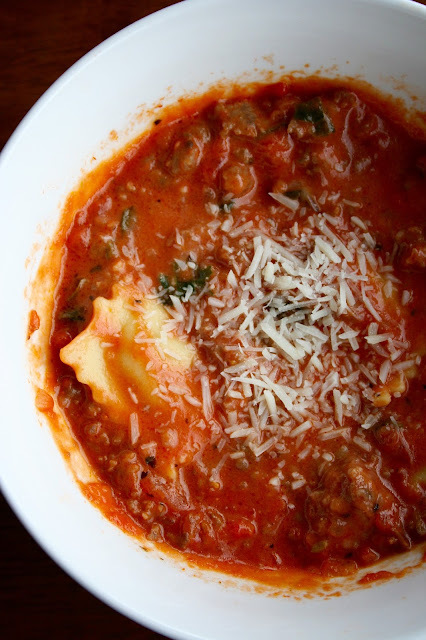 It's hearty, a little spicy and perfect on a cold day. I am not a huge sausage fan so next time I'm planning on using only a 1/2 lb. of sausage, but of course my husband loved the whole pound and proclaimed it to be the best soup he's ever had. All I'm saying is, your family will love this and you will, too. 1. In a large stock pot, brown sausage until no longer pink. Drain grease, if needed. Add onion and garlic and cook until soft, 3-5 minutes longer. Stir in basil and oregano. 2. Add crushed tomatoes and chicken stock and bring to a boil. Add ravioli and cook for about 5-7 minutes, or until ravioli is just tender. Stir in chopped spinach and cook for a few minutes more, until spinach is wilted. 3. Slowly stir in half and half. Return soup to a simmer and add Parmesan cheese. 4. Season with salt and pepper, to taste. If desired, garnish with additional Parmesan cheese before serving.